It’s hard to believe that April is almost here. I will be heading back to Mendocino, CA to wrap up my artist-in-residence experience. I spent 6 weeks there in the fall and returned home to finish the body of work started there. And now there is a body of work of 21 pieces! Thank you Fed Ex ahead of time! It has been pretty exhausting trying to realize this goal but I did it. You know when you want to throw in the towel and question things you do because you get so tired? I started feeling that way until yesterday when something from my past came back into my life to remind me of why I do art. About 15 yrs ago I received an Illinois Arts Grant to make an art quilt for the local cancer center. It hung for a long time and then a renovation took place. The cancer center was no longer going to hang it and they were kind enough to call me to return it. ‘Hope’ is a large piece, about 6′ x 4′. I picked the piece up and knew immediately where its new home had to be. 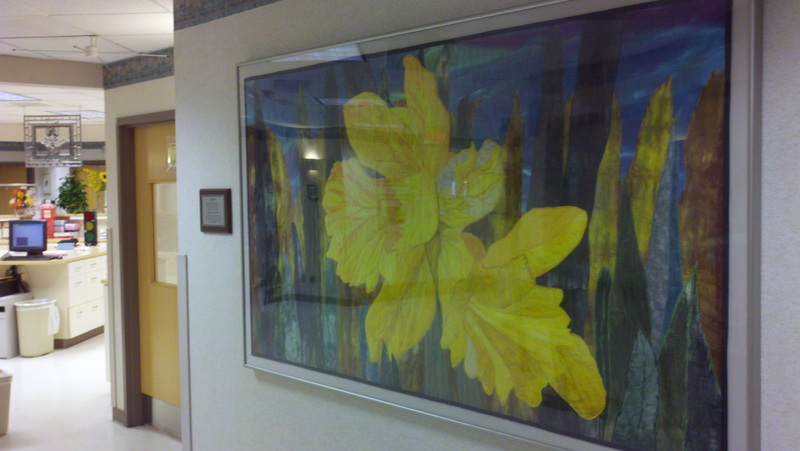 I carried the piece across the medical campus to the cancer floor of the hospital. A few years prior to that I spent a lot of time there with a young friend who eventually lost her battle with cancer. Kristin & I would hang out & talk about how to make the cancer floor better for patients and we dreamed that someday we’d get art quilts in there. So I walked into the area with the quilt and gave it to them. It took a few years but some special funds allowed the piece to be framed. As I entered the area, there it was! Gloriously gracing the entrance area greeting people with its warmth. I forgot how beautiful it was. There are giant daffodils coming out of the dark background. Daffodils are the cancer flower of hope. I started to cry as I took this in with a few of the nurses who remembed Kristin as well. Walking away I knew that my exhaustion made sense & I was reminded that I do art to try to make a difference. I can’t cure cancer but maybe with my art I can make the journey a little more tolerable. So find a reason to remind yourself why you do what you do. Grasp a time that stood out and allow yourself to be exhausted but to celebrate that exhaustion. Class Description: You know how normal people pick up the garbage from a sewing session & throw it away? This workshop is not for those people! The goal of this workshop is to create smaller size art quilt studies using ‘remnants’ & ‘pieces’ of fabric and found objects. Using your own personal stash of tiny fabric pieces you might throw away, snippets, cording, heavy paper, unusual fabrics, an old sock, a sleeve from a sweater, citrus bags…get creative! Establish a plastic bin of goodies to choose from. The more garbage you have, the more choices you will have for design options. Another idea is to bring quilts or other finished pieces & cut them up. ‘Garbage’ will be assembled, collaged & finished into postcard size art quilts while considering basic design elements of art. This is a great beginning class to help you find your design voice. 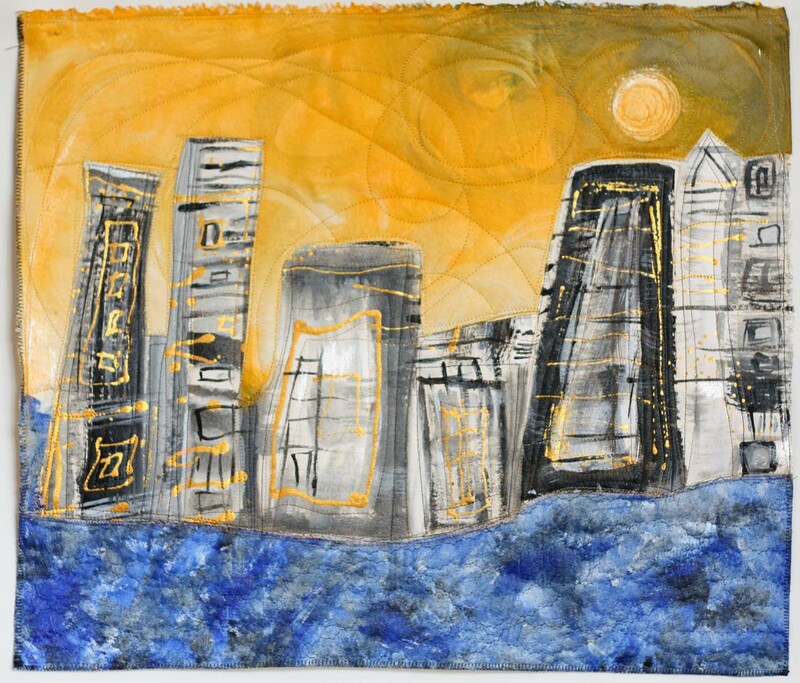 Ready to try to make some money with your art? This is a good starting place. This workshop will help you with basic concepts that will help you determine if establishing a business is the direction you want to take. The Quilt Surface Design Symposium has been critical to the non-traditional quilt movement in providing education for all those interested in exploring their own potential in the medium. To this end, we have selected the very best teachers available worldwide to give workshops annually at our conference here in Columbus, Ohio. This is a great beginning class to help you find your design voice. The goal of this workshop is to create smaller size art quilt studies using ‘remnants’ and ‘pieces’ of fabric and found objects. Using your own stash of tiny fabric pieces – snippets, cording, heavy paper, unusual fabrics, an old sock, a sweater sleeve, citrus bags or fat quarters that relate somehow – this will be the base of your design. Fabric will be assembled, layered, collaged and finished into small, postcard size art quilts while considering basic design elements of art. Sign up early! Plan a road trip to a really beautiful area of the country! Free Form Piecing—Make a Quilt Top with no Pattern! Have you ever wanted to make a quilt to snuggle under but did not want to be tied down to rigid rules, measuring and perfect points? If the answer is yes, then this would be a wonderful workshop for you! The goal is to make a “stress free,” creative quilt top. Participants will make a laptop size quilt top using the free form piecing method. A pattern is not used but color and compositional elements are considered to make a successful, fun and functional quilt top.